Grandmaster In 1983, the first national high school individual championship was held, won by Patrick Wolff. In 1983, the first video chess cassette was made, starring Orson Welles, Yasser Seirawan, and Larry Christiansen. In 1983, Bobby Fischer published "I was tortured in the Pasadena Jailhouse." In 1983, some of the prize fund for a tournament held in Ohio went to the Ohio Nuclear Weapons Freeze campaign. Rob Salgado won the 1983 USCF Golden Knights championship. In 1983, Joel Benjamin won the Manhattan Chess Club championship. 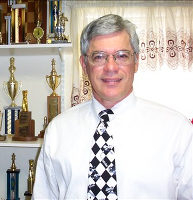 In 1983, Jerry Simon (1942-2006) won the Marshall Chess Club championship. In 1983, a TV series called "Chessgame" appeared in the UK. It was a drama series about the activities of British counter-intelligence agents. The show lasted 6 episodes. In 1983, Garry Kasparov won the Chess Oscar. In 1983, 500 Sicilian Miniatures by Bill Wall was published. In 1983, Vladimir Alatortsev, Murray Chandler, Lutz Espig, Dmitry Gurevich, Zlatko Klaric, Alexander Konstantinopolsky, Erik Lundin, and Predrag Nikolic became GMs. In 1983, the 84th US Open was held in Pasadena. Larry Christiansen and Viktor Korchnoi tied for 1st place. In 1983, Air Force Senior Airman Emory Tate, Jr. (1958-2015) won the 24th US Armed Forces championship. He would later win the Armed Forces championship 5 times and become an International Master, rated over 2450. The Air Force won the team championship. In 1983, Leonid Yarosh (1957- ) composed a direct mate orthodox Babson Task, thought impossible for 70 years. In 1983, Roger Long and Graham Croft played chess non-stop for 200 hours in Bristol, England. They played 189 games with Long winning 96 to 93. In 1983, a tied Candidates match was decided by a roulette wheel. On January 15, 1983 Central Africa issued 7 chess stamps depicting Steinitz, Nimzovich, Alekhine, Botvinnik, Spassky, and Fischer. Each stamp also had a chess position. The Botvinnik position is from Botvinnik-Capablanca, AVRO 1938. The Fischer position is from Fischer-Benko, New York 1963. The Alekhine position is from Alekhine-Rubinstein, The Hague 1921. The Nimzovich position is from Johner-Nimzovich, Dresden 1926. The Steinitz position is not from a Steinitz game at all. It is from Spassky-Smyslov, Bucharest 1953. The Spassky position is from Steinitz-Zukertort, 1886. The positions for Steinitz and Spassky were on the wrong stamps. On January 17, 1983, William "Bill" Martz (1945-1983) died, age 37. Martz won the US Junior Championship in 1965. He was awarded the IM title in 1975. In 1982 Martz was co-winner of the US Open. He succumbed to cancer and passed away in Milwaukee, Wisconsin. At one time, he played 104 consecutive USCF-rated games without a loss. On January 22, 1983, Etienne Bacrot was born in Picardie, France. He became a GM in 1997 at age 14 years, 2 months. 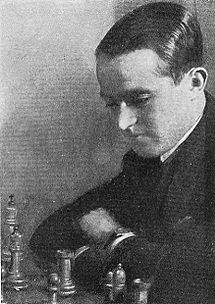 On January 31, 1983, Louis Statham, chess patron, died. On February 26, 1983 Congo issued a chess stamp depicting African chess pieces. In April, 1983, Anatoly Karpov won the 50th Soviet Championship, held in Moscow. In May 1983, Walter Browne tied for 1st at the New York Open, along with Tony Miles, Sergey Kudrin, Kamran Shirazi, and Lev Alburt. On May 2, 1983 the Faroe Islands issued two chess stamps depicting a king and a queen. On May 9, 1983 Vietnam issued 8 chess stamps showing older chess pieces. On June 13, 1983 Guinea-Bissau issued 8 chess stamps depicting chess pieces through the ages. On June 20, 1983 Albania issued a chess stamp depicting an individual playing chess and using a chess clock. On June 20, 1983 Bulgaria issued a chess stamp to commemorate the 8th European Team Championship in Plovdiv. It depicted chess pieces on a map of Europe. On July 18, 1983, Salo Flohr (1908-1983), Soviet IGM, died in Moscow. He was awarded the GM title in 1950. He is buried at the Vagankovo Cemetery in Moscow. In August 1983, Walter Browne, Larry Christiansen, and Roman Dzindzichashvili won the U.S. chess championship, held at Thiel College in Greenville, Pennsylvania. Each won $3,500. Browne won his 6th US championship. On August 16, 1983, Jordy Mont-Reynaud was born in Stanford, CA. He was one of my chess students and later became America's youngest master at age 10 years 209 days in 1994. On August 20, 1983 Nicaragua issued 7 chess stamps depicting chess pieces. On August 23, 1982, Gerald Frank Anderson died in Hove, England. He was the last person to play Alexander Alekhine. IJComp 1960; IMComp 1975. In August 1983, Garry Kasparov was supposed to play Viktor Korchnoi in Pasadena, California in the world championship semifinal match. But Kasparov did not want to play in Pasadena's hot summer weather, and the Soviet authorities said that Kasparov's security and access to Pasadena by his entourage were inadequate. However, other Soviet players suggested that Kasparov might be tempted to defect as his political loyalties were uncertain. There was also concern about Kasparov's Jewish background, and, at the time, there were tens of thousands of Soviet Jews actively seeking to emigrate. Kasparov was then forfeited in his match with Korchnoi, but this decision was later reversed, and the match was held in London. Kasparov defeated Korchnoi by the score of 7-4 and received $20,000. Kasparov went on to beat Vasily Smyslov to become official challenger for the world championship match against Karpov. On Sept 10, 1983, GM (1979) Victor Ciocaltea (1932-1983) died of cerebral apoplexy while playing his 4th round game at a chess tournament in Manresa, Spain at the age of 51. Ciocaltea became an International Master in 1957. He took him 22 years to become an International Grandmaster. He was Romanian champion in 1952, 1959, 1961, 1962, 1970, and 1971. A game between Fischer and Ciocaltea is mentioned in Bobby Fischer's book Bobby Fischer Teaches Chess. On September 19, 1983, the 3rd world microcomputer championship was held in Budapest, Hungary. It was won by Elite Auto Sensory. On September 26, 1983, Eileen Trammer (1910-1983) died. She was British Ladies' Champion in 1947, 1949, 1953, and 1961. In October 1983, BELLE became the first chess computer to attain a master's rating when its USCF rating was published at 2203. On October 22-25, 1983, the 4th world computer championship was held in New York. It was won by Cray Blitz, followed by Bebe and Awit. On October 24, 1983 Mali issued 4 chess stamps depicting drawn chess pieces. On October 31, 1983, GM (2000) Alexander Grischuk was born in Moscow, Russia. On November 15, 1983, Peter Dubinen died in Gorky. Grandmaster of Correspondence in 1962. He took 2nd in the 1962 world correspondence championship. He became an International Master in 1950 and won the 1957 USSR correspondence chess championship. On November 19, 1983, GM (2004) Varuzhan Akobian was born in Yerevan. On November 26, 1983, GM (2001) Baadar Jobava was born in Soviet Georgia. In November 1983, the 19th American Open, held in Santa Monica, was won by Larry Christiansen, David Strauss, and Nikolai Minev. On December 3, 1983, James Aitken died in Cheltenham, England. He was a former Scottish and London chess champion. On December 9, 1983, GM (1980) Janos Flesch (1933-1983) died in an automobile accident with his wife Ildiko Tenyel in Whitestable, England at the age of 50. He was returning from the Kasparov-Korchnoi match in London to a tournament in Ramsgate when he became involved in a car accident. On December 24, 1983, GM (2013) Irina Krush was born in Odessa, Ukraine. On December 27, 1983 Chad issued 9 chess stamps to commemorate the 60th anniversary of FIDE (1924-1984).